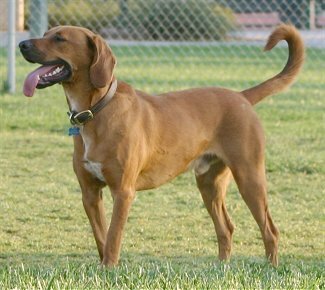 The Redbone was the second coonhound breed to be registered with UKC, the first being registered in 1902, two years after the Black and Tan. The AKC recognized this breed in 2009. Today it is used for hunting raccoon and as a companion dog. •	surprisingly affectionate and pleasant sounding bark. •	Loves being with people. •	Bred to hunt, this breed loves to follow scent and tree quarry. •	Have an 'exceptional nose' able to locate and tree raccoons faster than other coonhounds. •	Alert, quick and loves to work in all kinds of weather and terrain. •	Has been used to trail and tree bears, cougars and bobcats. •	Happy to work with their master one on one, or in packs. •	Not great with small pets, like cats and other non-canine pets/rabbits, hamsters, etc. •	Can be droolers ~ some do, some don't. •	Prefers good amount of exercise every day. Not a couch potato breed. •	A healthy breed, but have been known to develop hip dysplasia. •	Not great off leash ~ will take up their hunting instincts and good luck trying to keep up with them! The Redbone Coonhound is a very happy, mellow and even tempered dog. They are also very affectionate and love being with people. They are excellent with children, especially children that are used to dogs and want to play. At times, they enjoy playing so much, that they can almost be overwhelming to a small child. They have a very pleasant sound bark, although when left alone indoors, their bark does tend to turn into a howl, which isn't such a pleasant sound. In spite of the bark having a pleasant sound, it is also very loud. The Redbone Coonhounds are not a dog that needs to be busy at all times, as long as they are with their family, they're happy. They are very energetic dogs that if not allowed the room to romp around will misbehave in the form of chewing on things and they will chew on anything. They are also very independent thinker and will spend a lot of time trying to solve a problem such as getting out of a fence or pen. They Redbone Coonhound will not give up as easily as some dogs when a problem arises. These Coonhounds, while not great with small pets, do get along well with cats if they've grown up with them from the time they were little. If they haven't they may consider them as prey and chase them. It is a good idea to always keep them on a leash if taking them for a walk, as they will chase after small animals in the same manner that they would hunt and tree a raccoon. They have a natural treeing instinct bred into them and regardless of the training, they will still want to tree other animals. Often when the dog is in pursuit of something, it will appear that he is in a world of his own and may not even respond to your voice. Very few family members will not love having the Redbone Coonhound as a family pet. They are loving, trusting and extremely affectionate. Because of the high energy and happy personality, they are great at playing catch and other games with children. The Redbone Coonhound is a great hunting dog that thrives on the hunt and the chase and is best when allowed to do this. They do enjoy being indoors just sitting around with their family, but shouldn't be allowed to do this too much as they are very prone to become lazy and overweight. Because they are so energetic, they need a lot of exercise so they don't get bored. A bored dog is usually a destructive dog. They also need exercise to avoid becoming obese which is a problem for many Redbone Coonhounds. If the dog becomes overweight, he will not be as productive at hunting. They have the natural hunting instinct in them so if they are left alone too often, they will roam and try to go hunting on their own. Being the great problem solvers that they are, if there is a way for them to get out, they will find it. They love going for walks and runs and it's important that they get to go daily if they are confined indoors. They need to be on the leash at all times to avoid a great chase if they encounter another animal. You may feel that since he's a hunting dog, training for the Redbone Coonhound mostly involves tracking and hunting training. This is true to some extent as that is what he will be doing a great deal of the time. However, there is other training he will need from the time he is a young puppy. If he will be spending any time at all in the house, you will want him to be housebroken. They do mature slower than other dogs, but you will still be able to house break him. Basic obedience is very important to every dog. They need to learn the basic commands of "sit" "down" "stay" and "come". Once you start the training, you need to be consistent with them so as not to confuse them. If you don't have the time to train them, find a trainer that can do this for you and your dog. They are not as easy to train at a young age as most dogs because the mature slower both mentally and physically. So, expect that "puppy behavior" must longer than normal. As he is older, though, he will pick up on things much quicker. Once he is older, you will find that they are very quick to learn things. You will also want to start training him for hunting at a fairly young age. This training will go much smoother if he's already mastered the basic obedience. Although, much of the hunting skills are already bred in him, the techniques will have to be taught. Often hunters go with their dogs in crews, "run them", and train them together. The Redbone Coonhound has a great drive for chasing, treeing and killing many animals so is the perfect choice to train to hunt bear or mountain lion. Because of this drive, he may not be the type of dog you want if you do not want the animals killed. Not only will you be doing something that your dog loves and was bred for, but you will be giving him some excellent exercise.